The view was exceptional, but the best part was Pio and his mom. We will DEFENITELY book this hotel again. No regrets! Location, location, location. Our room had a wonderful view of the city and the sea. This is a beautiful place to stay at, and the owner Pio is a great person who took care of us and went out of his way to make our stay a wonderful time. Perfect view from the room. Great location to visit Amalfi, a 10 mins walk though the tunnel. Great breakfast. We had home made hot croissants every morning made by Magdalena. She was the sweetest woman. The owner was helpful in every way. You could not beat this location and the balcony provided a birds eye view of the beautiful beach. What a perfect way to wind down from a hectic tour. This little hidden gem of a village is heaven. Thanks so much. The location and view were amazing! The breakfast was also lovely and every request we had was handled with great speed and efficiency! This room was perfect as we were exploring the Amalfi Coast. It was close and easy to access. My girlfriend and I arrived at Eva’s Rooms on June 27 and stayed until June 29. We were welcomed by Pio who runs Eva’s Rooms with a cold glass of freshly squeezed red orange juice. He showed us around the room and answered any questions we had about Atrani and the Amalfi coast. The best part though is that our balcony had the best view of the water and the entire town of Atrani - it was absolutely stunning. Also, The breakfast is personally delivered on a cart to your room first thing each morning with fresh croissants and fruit. Definitely would stay here again if we have the opportunity. Thank you again Pio! The view can not be matched, the location is perfect, and the staff was awesome. Located in the heart of the Amalfi Coast, the family-run Eva Rooms features elegant rooms with a large private terrace overlooking the sea. It offers free Wi-Fi and is only 150 feet from the beach. These bright, air-conditioned rooms come with a flat-screen TV, mini-bar and private bathroom with free toiletries and hairdryer. Each morning, a sweet breakfast will be delivered to your room and can be enjoyed out on the terrace. 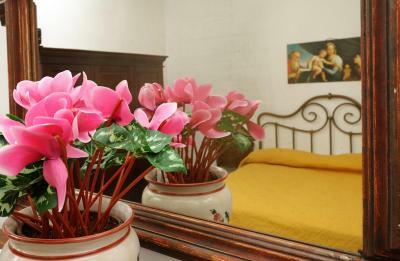 Eva Rooms is 500 feet from the center of Atrani and a 30-minute drive from Salerno and Sorrento. The helpful owner can assist with tourist information and can organize an airport shuttle service. This elegant, air-conditioned room features a large private terrace overlooking the sea and city. 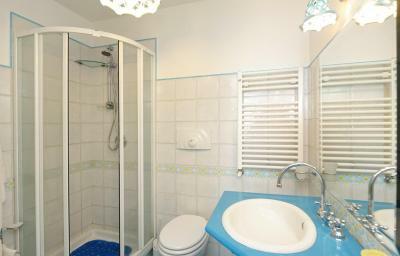 It offers a flat-screen TV, mini-bar and private bathroom with free toiletries and hairdryer. Wi-Fi access is free. ATM card Eva Rooms accepts these cards and reserves the right to temporarily hold an amount prior to arrival. Eva Rooms accepts these cards and reserves the right to temporarily hold an amount prior to arrival. The airport shuttle comes at extra cost. Everything was excellent and the only minor issue I could think of was that the place is a little hard to find (from the bus stop, take right towards the tunnel, once you are at the entrance of the tunnel, take the road on the left and Eva rooms is on your right at the bend in the road). 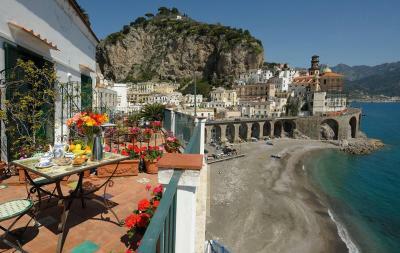 The location is very convenient (close to Atrani bus stop) and much less touristy than Amalfi. 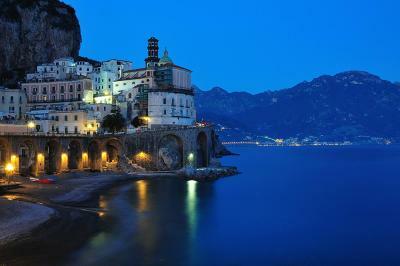 Its only a 5-6 minute walk to Amalfi. The views from the balcony overlooking the Tyrrhenian Sea were spectacular, especially during sunrise and sunset. The breakfast was excellent with a good selection of pastries, fruits, juices and coffee. Pio and family were very welcoming and gracious hosts, which made the stay extra special. 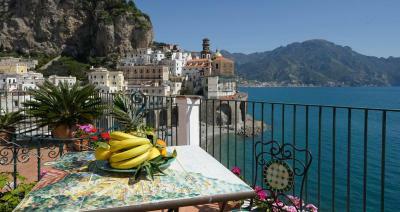 There are some really good restaurants in Atrani as well. 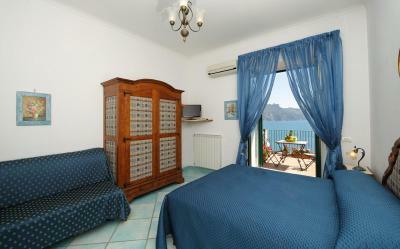 Overall a wonderful place to stay if you are in the Amalfi coast. Outstanding view, friendly host, beautiful location. 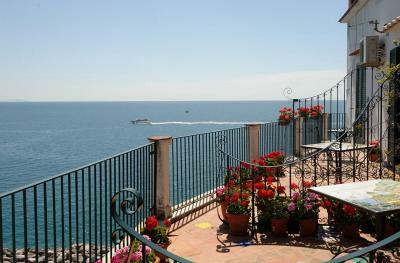 We loved the property location on the beach with the amazing view and the walking option to both Atrani and Amalfi. Mama Madeline gave us a wonderful recommendation for a local seafood restaurant that we loved.The cherry on the cake was the amazing breakfast on the terrace in the morning. This stay was the best part of our trip to Amalfi and I wish it had been longer. 11 out of 10 stars!! 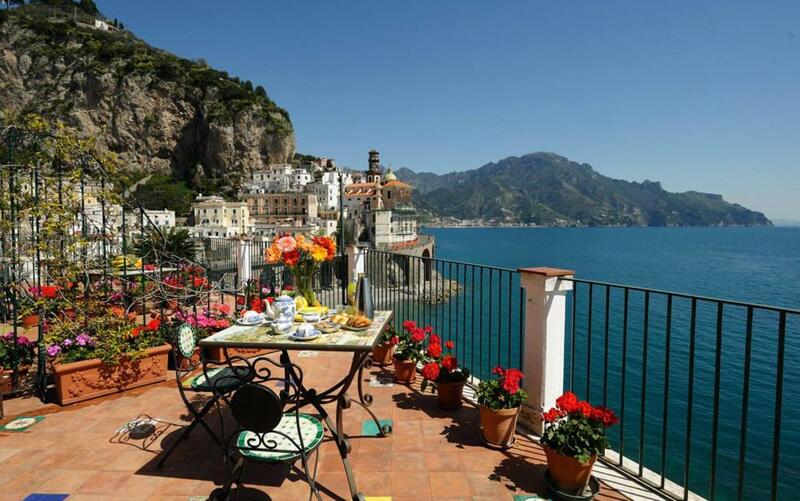 The view from "Eva Rooms" is the best of Atrani for sure. Eva is a really kind host and she gave us great and convenient advice. 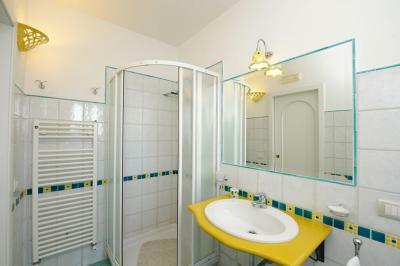 The room was big, comfortable and decorated in the style of the Amalfi Coast. The breakfast was good and eating in the terrace with the view of the little town and the sea was an unforgettable experience. We hope we can return in the future. The hotel had the most amazing views to the sea and Atrani, what a fab little find, breakfast on the balcony in winter was even fun! Lots of stairs to get to the rooms, but well and truly worth it! Comfy bed, great continental breakfast. there is nothing bad about this place. it was absolutely fabulous. Pio was a great man.he is the best . the room is much better than pictures. the location is amazing. Our room was very nice with some beautiful old furniture, but the absolute selling point of this place is the 180° balcony view over Atrani, its beach, some more coastline, and the sea. In fact, we recognized this as the exact view they'd chosen for the front cover of our Naples Bay guidebook! Breakfast is brought to the room on a trolley so you can choose to have it inside or outside, but believe me, unless it really rains you'll want to be out on the balcony. Parking is not included, but a garage just before the little tunnel (coming from Amalfi) offers long term parking for 20€ a day (if you don't use the car in between!). To get to Eva Rooms from the garage, cross the road carefully just before the tunnel and walk through the outside area of a restaurant. The tunnel is short, but definitely unsafe to walk through! 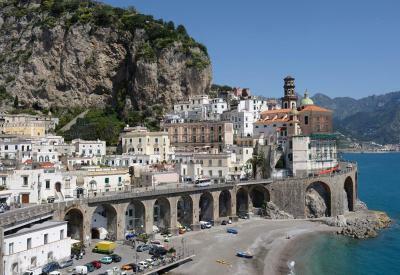 Amalfi can be reached by a short and safe walk through a pedestrian tunnel from the garage. There is quite a lot of stairs which may be a problem for some, not for us. Excellent location & views. Quiet. Excellent location to walk to Amalfi via the LunaRossa pedestrian tunnel. Lovely terrace with a stunning view with table & 2 chairs where you eat your breakfast. Also 2 chairs for relaxing & a little clothes line on the terrace. Comfy bed, fridge, nice breakfast, room serviced daily, sofa & small table & chairs inside, beach towells provided. Pio & his mum Magdalena are lovely hosts. 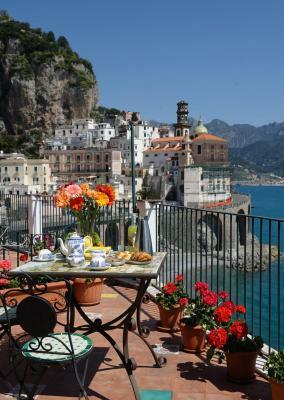 We loved our stay at Eva Rooms & in Atrani. the steps but that is Italy.